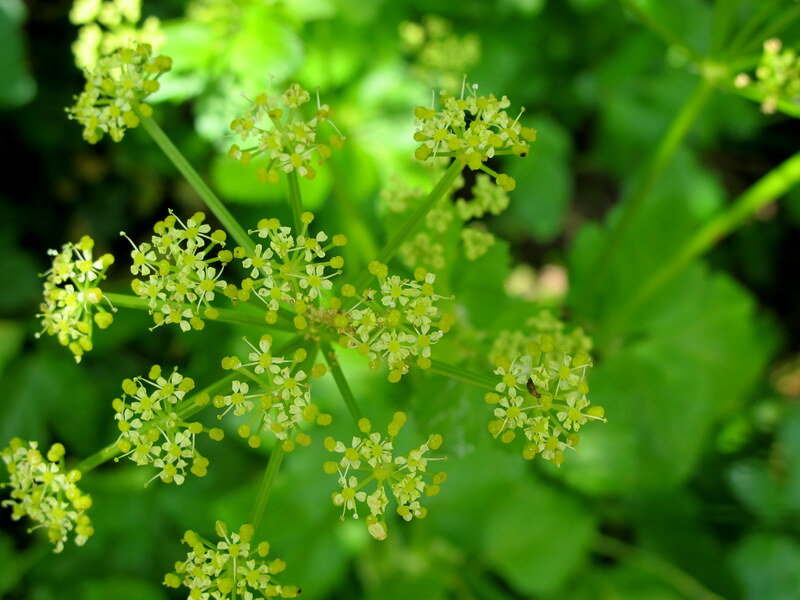 Cornish wildflowers: alexanders | Notes from the U.K. This entry was posted in Gardening and tagged alexanders, British wildflowers, Cornish wildflowers, edible wild plants by Ellen Hawley. Bookmark the permalink. You could be right about it being very English but I’m just not sure. My partner was a dedicated birder before she lost part of her sight, so the idea of having books that catalog the natural world came to seem fairly normal, even before we moved here. What’s particularly British, is the profusion of wildflowers that drove me to buy flower books. For a while I tried keeping track of them without being able to name them, but it’s impossible. I’d think, Okay, little yellow flower; bigger yellow flower; other yellow flower that might be bigger than the first one but might not be because I forget how big it was. And so on, endlessly. I bought my first flower book to keep myself marginally sane. Ah. The pompous capital, one of my pet peeves. Perhaps it is a journalistic Thing. I take my red pen to the pompous Capital, yet still authors insist on using them. I find it so annoying that I deliberately use lower case for the odd few words that could, possibly, maybe, justify a Cap. I am wary of claims that all parts of plants can be eaten. While nasturtium flowers and leaves are well and good, I tried pickling the seeds on the lure of them tasting like capers. They didn’t. They tasted like nothing. Mmmmm, yum, the taste of nothing. How could you resist? I have the same reaction to the pompous cap. (I never thought to call it that but will from here on. Thanks for that.) When I edited a small writers magazine and got to set the house style, it was radically lower case. I’m sure I drove the organization it belonged to nuts, because all its important committees lost their caps. Vengeance is sweet. Ah. Yes. The Committees. I can live with the Recreation and Amenities Committee because it is a title. But the Committee? No. I don’t even like writing the Queen, the Government, the House etc. I can possibly accept the Queen because I think she has a crap job and has worked hard. But the goverrnment and house are the very definition of pomposity. Incompetent pomposity at that. No caps for them. Off with their caps! I worked with a journalist for a while whose rule about capping titles was that it was only if it was actually being used as a title in the sentence. So Queen Elizabeth, but the queen. I continue, in my relentless and pig-headed way, to use that style. Which is sort of funny, because now that I’m retired I don’t care about a lot of style questions. Caps, though? They still make me snarl and snap. I like your journo friend. I suspect me and s/he could be off with their caps pals. One, refers to the Queen of England, or Queen Elizabeth the Second, or possibly Elizabeth Windsor. Thereafter, why not the queen? Perfectly clear. We aren’t talking about any other queens. Lack of clarity in writing. Hence the invention of the Pompous Capital. I think pompous deserves a cap too. Absolutely it deserves a cap. We may have to design a rule to justify it, but it can be done. And yes, you’d have liked my journalist friend. He was a bit of a madman, but an absolutely lovely one–now gone, unfortunately. Alexander grows in abundance on the Norfolk coast also and smells rather super, I think. With regards to Herbert (or herbert) – my mum has always used it to indicate someone of rough or questionable character, usually youngsters, as in – ‘They look like right little herberts’. I know of no British Herberts at all, but a friend of mine from Nashville has it as his middle name. “Right little herberts” has a convincing rhythm, don’t you think? Once you hear that, how could you disagree? Herbert’s one of those generational names in the U.S. Even when I was a kid, it wasn’t popular anymore. As far as I can remember, I’ve known some Herbs in passing but never any Herberts who used their full names. It’s a great phrase, isn’t it? My mum has some real gems. I don’t use it much myself, but I might revive it! I think it is a traditional family middle name that has been passed down, in the case of my friend. It’s a bit of an odd name, to my ears. Might be okay for a pet. One of the massively weird things about living here is that everyone around me hears overtones in names that I don’t hear at all. I could easily name some harmless little piece of fluff Herbert and convince everyone around me that he’s a thug. Haha! For languages that are almost identical, there really are the biggest and most profound differences! Truly. And may I mention, since the topic of body language hasn’t come up, that I just accidentally gave a friend the two-finger salute? She’s used to me and didn’t even react. How very decent of her. A two-fingered salute is very Anglo Saxon, you are clearly mastering the language on all levels! Random capitalisation of nouns is the bane of my life!! Well one of them… I am always explaining to the lovely engineers I work with that capitalising things for emphasis and because they thing the word is important is not a thing!! Well of course you should capitalize it. It’s important. When I put together a style sheet for the magazine I edited, it was with the illusion that everyone in the organization (which is to say, the repeat offenders) would read it, memorize it, and never do any of the things that pissed me off again. Ha. Double ha. Nothing changed, although I admit to having had a lot of fun writing it. Ha indeed…I am in the middle of writing one of these… so it can go in the unread section of the wiki along with the proof reading checklist. I seem to remember someone in that same organization keeping a carefully organized log of procedures and decisions that got made in staff meetings. If anyone read it, I’d be shocked. But by then I’d gotten too cynical to bother saying anything about it. I did a style sheet too. Woe betide anyone who didn’t stick to it 😈 They actually did! You must’ve had more clout than I did. Probably. I ran the chief exec’s office on the side. Good job. Hellish pressure. But engineers, and software engineers in particular, are generally very bad at writing about their disciplines. I say this with some confidence, because I am (or rather, was) a software engineer who changed career to become a technical writer. I think I was reasonably good at it – the writing that is. I wish there were more writers who understood software enough to communicate with the rest of us about the stuff. Some of the efforts I’ve read are hysterically incomprehensible. I don’t mind people getting it wrong once…or even twice but every time just shows lack of care! Or maybe a lack of ability in that field, do you think? If I had to handle numbers repeatedly, you could explain them to me a hundred times but I’d still cut myself on the sharp edges. I know!! Outrageous idea isn’t it? Thanks for the answer. Sorry I wasn’t able to get here sooner. I guess I would have been more sorry, had I been bitten by a snake in the meantime. I like the flatulence and snakebite are somehow on par with each other and can be cured with one magic herb. Good to know. I wonder if I can substituted “snakebite” in the event of an untimely gas attack? Sorry, this comment is going off the rails. I work with a lot of capital-happy corporate people. I’ve spent years lower-casing capitals in presentations. Some bullet points had every noun capitalized. I’m with you on not provoking urine. Of course, the remnants of my teenage brain want to know, if you provoked urine, would it be p*ssed off? Or would you only do it if you used pissed the way they do here, to mean drunk? I have friends who, I suspect, would rather have snakebite than flatulence. There’s no accounting for taste, is there? Ha! No, I’ll take anything over snakebite. So now I can say I was pissed and people here will just wonder why I was angry. I like that. Absolutely. Just another international incident that starts so innocently. > Some bullet points had every noun capitalized. I didn’t understand the declensions, but they cracked me up anyway. The funniest part is that I can’t figure out whether or not you’re serious. Yep, I’m serious about both points. Though English is grammatically a Germanic language, it long ago abandoned gender for the majority of nouns, but German cetainly hasn’t. All nouns are masculine, feminine or neuter, and the definite and indefinite article has to “agree” with the gender of the noun: der Mann (the man), die Frau (the woman), das Buch (the book – gender is neuter). Even worse, on top of that you have to “decline” (some weird grammatical term) according to what role (“case” – another grammatical term) the noun plays in the sentence. For example: “Die Frau sehe den Mann” (the woman sees the man). In this case it’s den Man, not der Mann, because the man is the object of the sentence, not the subject. Then if we’re talking about indirect objects like this: “Der Polizist gibt dem Mann einen Strafzettel” (the policeman gives the man a ticket), you have to say dem Mann, not der Mann, because now the man is the indirect object of the sentence. There are four of these cases that you have to learn the declensions for: nominative (subject), accusative (direct object), dative (indirect object), and genitive (possession). And adjectives decline (have different endings) in accordance with these rules as well. It’s a nightmare you have to deal with when you learn German. Old English did the same thing, but with the coming of those naughty Norman Frenchies into our green and pleasant land in 1066, the whole lot got simplified during medieval times, leaving us with a mongrel language that doesn’t bother with such niceties – thank goodness. I studied a Russian for a year a bit more than 50 years ago, and when I quit we’d just been introduced to cases, which I thought of as conjugating nouns. I sort of understand the concept but can’t do anything useful with it. I’ve never found a reason to be grateful to the Normans till now, but I’ll join you in being grateful. No, but the presenter is an underwriter – that explains a lot. Sounds like a worthwhile counterbalance. I was thinking that I’d never heard of alexanders despite the plant looking familiar. Then you referenced horse parsley and I realized I did know it. My Granddad liked to pick wild herbs and things like wild garlic when we were out for rambles. I don’t recall consuming it but perhaps I did and it never made an impression. My Dad’s name is Herbert. He was accidentally named for his uncle so I think even in his generation the name was very much waning in popularity. He’s always gone by Bert. My Mum, however, calls him Herbie from time to time which gives away the fact his Bert is short for Herbert rather than Albert or Robert. Bert’s a great solution. I knew a Mary who went by Ry (pronounced Rye), which suited her much better. That is not a shortening I have come across. Very original. My Dad loathes his given name and sadly the uncle responsible for his name did not gift him a middle name so he was stuck with it. He made all of his children and grandchildren promise they would never name offspring after him. I don’t think there was much risk any of us would even consider it. My grandmother’s name was Bertha, and when she heard that a great-granddaughter had been named after her she said, according to my mother, “Why did they have to give that lovely child such a horrible name?” When she got old enough, the great-granddaughter changed her name. No way! My maternal grandmother’s name was Bertha too. I don’t think she minded her name but it certainly did not get passed on to future generations. With some names, it strikes me as odd that they gain and lose popularity, but Bertha? No. I think I understand why that went out of circulation. Actua y, seeing that in print it now seems fair y easy to make out what I was getting at. Perhaps L’s don’t matter much at a . Great comment. It’s surprising how far you can get without that etter. Not to be difficult, but I kind of like the name parsley worms. Yeah, off with their caps! Will never mention a guillotine again, Ellen. Maybe we could just blow their caps off with a gentle whoosh of hot air. Anyway, have just sat and chuckled my whole way through your piece and ensuing comments. What a lovely way to spend a few minutes in the garden. No alexanders round here however. But a lot of Alexandres (I almost put an apostrophe there but no, this is just a plural) to be found in this city, of all ages, shapes and sizes. I much prefer the name Alexandre–or Alexander–to Herbert. So let’s hope peace is restored, however briefly. The last Herb I can remember getting any type of prominence was the love bug, and that’s only after they ‘cutsied’ his name to Herbie. Had the anthropomorphic vehicle been Herbert, I suspect children would have run screaming from him in terror. No capital letters were abused in this post. I’m relieved about the capital letters. I can’t tell you what a weight that takes off my mind. I’m still pondering over the precise meaning of Ice Badger’s statement :”…the bane of my life, well, one of them anyway…” How many lives does he have ? You raise an important question there. Being that she’s an ice badger and all–well, I don’t know much about the life cycle of the ice badger. So maybe several. We’ll have to wait and see if she enlightens us. I’d never heard of alexanders, despite being a plant nut, so thanks for the info. As for Herbert, yes it’s an old-fashioned name, but to many (including me) it’s associated with Herbert West, who is quite an interesting character. I’ve never heard of Herbert West. Thanks for the mention. So many Connections! So little Time! As I am a Sandra, I am derived from Alexander, so it warms my Stomach to know I have an Urb of my own over yonder. Plus, my uncle Herbie was a dear, sweet Man who, like all of us on that Germanic side of the Family, excelled at Flatulence. More Wildflower News, please! I may find more Relatives who switched genders half-way across the Pond. Switching genders, at least as I understand it, isn’t a quick process. It’s amazing anyone can do it in this age of rapid travel. I think it’s the Germanic influence that accounts for all those capitals. I don’t know German, but my understanding is that they’re responsible for unleashing all that into English. Figures. That side of my Family was never satisfied with Anything. Herbert [*alice announces in an authoritative tone, albeit apropos of nothing of any real significance*] was my favorite name as a child, for reasons now lost to the sands of time. Supposing there were ever reasons to begin with, that is. I named everything Herbert. EVERYTHING. The goldfish I got with a special coupon from a McDonald’s happy meal. The boy at school I had the crush on–who had a name of his own already, but I called him Herbert regardless. (#flirtinglikeabawse) The good pencil sharpener. Please don’t ask about that last one. I am quite sure I can’t invent even an implausible explanation. Herbert the Goldfish, I am sorry to report, being of an exceptionally weak constitution even for a happy meal-coupon-prize fish, died less than 48 hours after I brought him home. I buried him out back beneath an enormous pine tree, where I held mournful vigils in honor of poor departed Herbert for almost a week, at least. Thank heavens I still had the pencil sharpener to console me. Yup. Pencil sharpeners are tough. You have to admire them. One of our godkids named all her dolls Cindy. Every last one of them. All I can say is that kids’ minds are strange. I used to work with a woman whose going theory was that they’re not actually from this planet. Very interesting, Ellen. I am wondering if we have alexanders here in the states. I can’t say definitively that you don’t, but when I google “Alexanders United States” I get things like Alexander v. United States and when I add flowers I get florists named Alexander’s. When I try that with the word flowers, otherwise it gets weird, and Britain, I get information on the plant. The problem may be that the Romans never invaded the Americas. LOL. I appreciate you consulting with Dr. Google. Don’t let him overcharge you. Thanks for the warning, but I’m very careful about that. The wildflowers here in the Hill Country are not as abundant this year as they were last year. Well, “here” means in our immediate neighbourhood. There are other areas where they blossom(ed) like mad. Hey Pit. This ended up in spam for some reason. Apologies–I wasn’t ignoring you. Or not deliberately. Hihih, I had to giggle at Plant Capitalisation, and when white sauce and colour blindness hit I was already reading it out to amore. ♫♪ Gotta love a good, argumentative and example-rich article. I’m highly interested in British-American differences of all sorts. That’s good, because the differences seem to be endless.